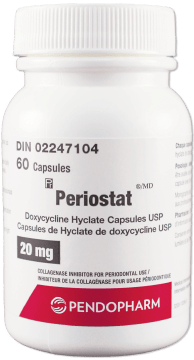 Periostat helps to reduce the over-production of collagenase (enzymes responsible for the destructIon of collagen) and osteoclasts (bone cell responsible for the resorption of bone) that are present in overabundance during a chronic, prolonged and destructive inflammatory response. 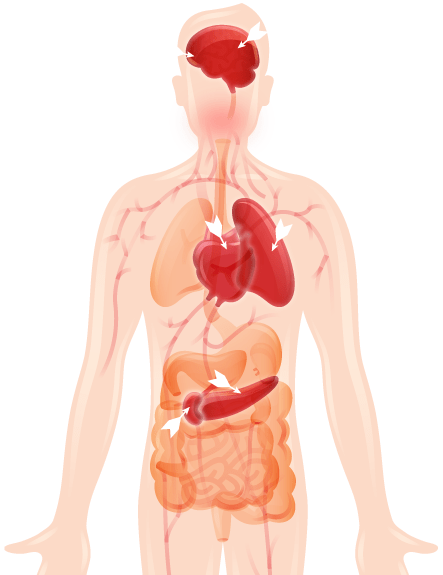 This exaggerated inflammatory response is common among chronic inflammatory diseases such as periodontitis, cardiovascular disease and rheumatoid arthritis. Therefore, Periostat, when used (BID) for 6 to 9 months, helps to modulate the chronic, prolonged and destructive inflammatory response into a normal and healthy inflammatory response process. Collagenase inhibitor for periodontal use. 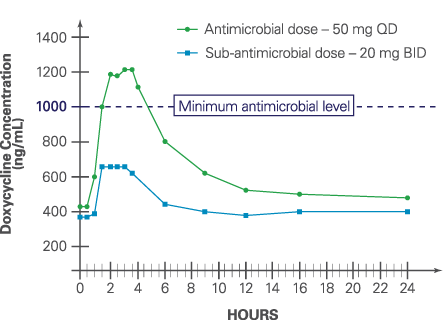 Periostat does not cause sun sensitivity, nausea or antibiotic resistance. • Absorption of doxycycline is impaired by antacids containing aluminum, calcium, or magnesium, and iron-containing preparations. • Absorption is also impaired by bismuth subsalicylate. • Barbiturates, carbamazepine and phenytoin decrease the half-life of doxycycline. • Pregnant or nursing women, children, tetracycline intolerant individuals or liver disease sufferers should not take Periostat. Consult the product monograph for important information relating to adverse reactions, drug interactions and dosing information which have not been discussed in this piece. 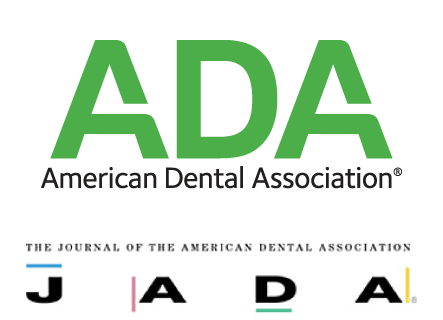 • Improvement in periodontal disease with SDD + SRP.
" 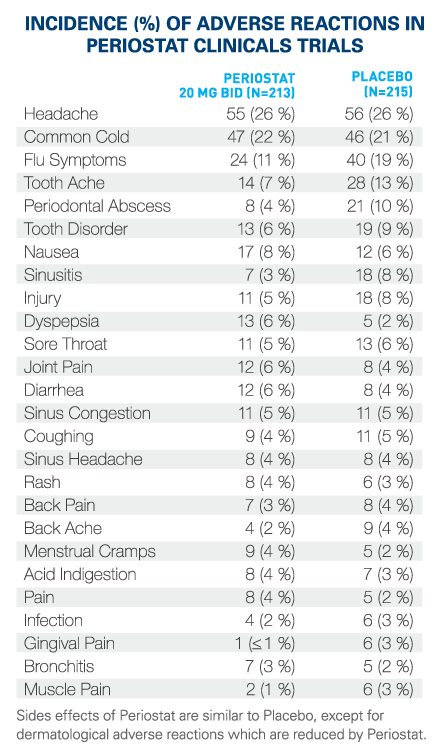 Research has shown that periodontal disease is associated with several other diseases. 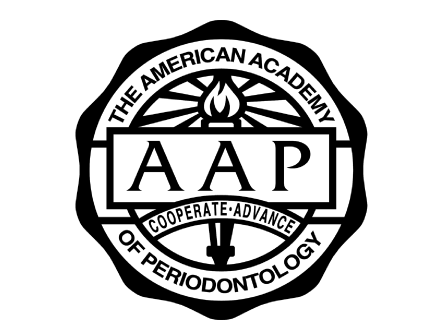 For a long time it was thought that bacteria was the factor that linked periodontal disease to other disease in the body; however, more recent research demonstrates that inflammation may be responsible for the association. Therefore, treating inflammation may not only help manage periodontal diseases but may also help with the management of other chronic inflammatory conditions. " I just had a patient return after 2 months of Periostat. He's very compliant with recommendations and has localized severe chronic perio on the max molars. Today, I found that both sites had a significant decrease in bleeding on probing. And the deepest site, a 9mm, decreased to 6mm! I was so excited as I had no expectation of so great a result in an area of severe bone loss! It was terrific! *JADA 146(7) http://jada.ada.org July 2015 p. 525-535. Ryan ME, Lee HM, Bookbinder MIC et al., Treatment of genetically susceptible patients with a subantimicrobial dose of doxycycline, Dent Res 2000:79:608 (abstract #3719).